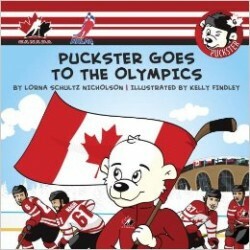 Puckster has been selected to act as Team Canada’s stick boy at the Winter Games in Sochi, Russia. He is so excited because he is taking a big surprise with him for all the fans. When one of the players gets hurt, Puckster plays along with NHL superstars Sidney Crosby, Rick Nash, Jonathon Toews, Duncan Keith and more. So Puckster also got a big surprise!